When it comes to senior falls, we can’t be too relaxed. Falls, after all, can cause a lot of health issues for our aging loved ones, which include fracture, traumatic brain injury, and even long-term care. You can always seek assistance from providers of Home Health Care in Vancouver, BC to care for your aging loved one, but implementing safety measures at home will always be beneficial. 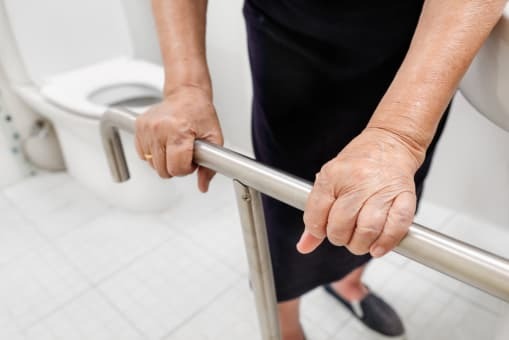 Let us share with you these important safety guidelines to protect your loved one from elderly fall incidents in the bathroom. Your aging loved one will need to grab on to these bars when they feel like they’re losing their balance or when they move about the room. This helps them keep steady so that they will not slide on the slippery floor. Even when your aging loved one is accompanied by a provider of Senior Home Care in Vancouver, being able to bathe on their own can be a great booster of their personal independence. With rubber mats on the bathroom floor, you can relax that they don’t slip easily even without companions. When your senior loved one feels like they can’t stand for a long period, having a bath seat as an option can prevent them from accidental fall in the bathroom. Just ensure that these seats are securely set in place. As much as possible, allow your senior loved one to bathe on their own. This simple task can give them a sense of confidence that there’s still something they can do for themselves. However, when they have sudden reactions to the water temperature, whether it’s too hot or too cold for them, their reaction can cause them to fall. Make sure that the water temperature is always at the right level. Keep your aging loved one from walking back and forth from the bathroom to their room. Make sure that when they use the bathroom, all their essentials are already there. The lesser walks they have in the bathroom, the lesser the chances of falls. Keeping your senior loved ones safe and well is also our priority at Peachtacular Home Health Care. When you seek our assistance to keep your loved one company at home, you can trust that we will give our best in providing Home Care Services in Vancouver. If you’re interested to learn further about our services, just keep in touch with us. This entry was posted in Senior Care and tagged Health Care, Home Care, personal independence. Bookmark the permalink.